National Day celebration would not be complete without the elaborated and colourful fireworks in the sky. 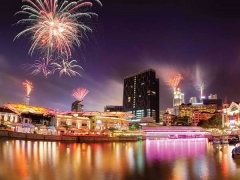 Join us in honouring Singapore 53 years of independence. Book our Superior Bay View Room and have the comfort of viewing the spectacular fireworks from your room or book our Premier Rooms which you will have the access to our Premier Lounge and enjoy this special moment from the 24th floor. Do note that this gorgeous view will be available on 28 July and 4 August too! It's A Lot Better At Novotel.